A leader in mobile, fixed, IP and optics technologies and a pioneer in applications and services, Alcatel-Lucent includes Bell Labs, one of the world’s foremost centers of research and innovation in communication technology. We bring an unmatched heritage of ideas and execution to the challenge of realizing the potential of a connected world. Our customers turn to us for our ability to deliver on their future. With operations in more than 130 countries and the most experienced global services organization in the industry, Alcatel-Lucent is a local partner with a global reach. Alcatel-Lucent achieved revenues of Euro 16 billion in 2010 and is incorporated in France and headquartered in Paris. The data traffic demand is exponentially growing and becoming increasingly diverse. Indeed, future 5G mobile networks shall support multiple technical and service requirements, such as high throughput, low-latency, high reliability and availability, large storage capacity, cost-efficiency and operational energy-efficient features. That context brings many new challenges to develop suitable 5G technology. In order to cope with the conflictual requirements, future wireless 5G networks have to change in two ways. First, network deployments have to get dense (cells smaller and part of base station closer to the mobile user) and tightly coordinated (severe interference avoidance). Second, networks have to dynamically adapt to meet the diverse requirements of multiple applications. For this, it has to be flexible, intelligent, distributed and programmable. That is why, it has been suggested using for 5G: network function virtualization (NFV), xRAN architecture (that includes SDN principles) and network slicing in order to cope with multiple constraints and demands. Inspired from SDN approach, the xRAN architecture decouples the control plane from the data plane and split in independent components (centralized and distributed BBU and RRH/RRU) the traditional one size RAN. xRAN relies basically on software-defined access points that may be configured remotely in a similar way than SDN switches. Such a design approach enables to dynamically instantiate, update, manage and delete XRAN slices in a very cost-efficient way. xRAN combined with NFV and slicing driven by data analytics, will definitely provide more open, agile and evolving RAN characterized by a simple architecture, an independence between data delivery infrastructure and control functionalities, and surely reduced deployment and operational costs. In such a context, the following main issues should be addressed: (A) in which way xslice should be created and maintained? (B) How failures and errors observed in xslices in xRAN should be detected and handled? (C) Should physical and virtual resource dedicated to fix failures or errors be included/reserved/allocated upon the xslice creation/configuration? And (D) In which way resilient solutions that mutualize virtual resources between multiple tenants may operate? There is a large panel of network resilience solutions that may be deployed inside a given network. The choice of “suitable” solutions depends on the investment that the infrastructure provider is willing to make and the type of involved services. The existing solutions may be either reactive or predictive resilience approaches. (1) The network state forecasting: using Machine Learning techniques working on time-varying covariates and landmark analysis applied to discretized network state maps. 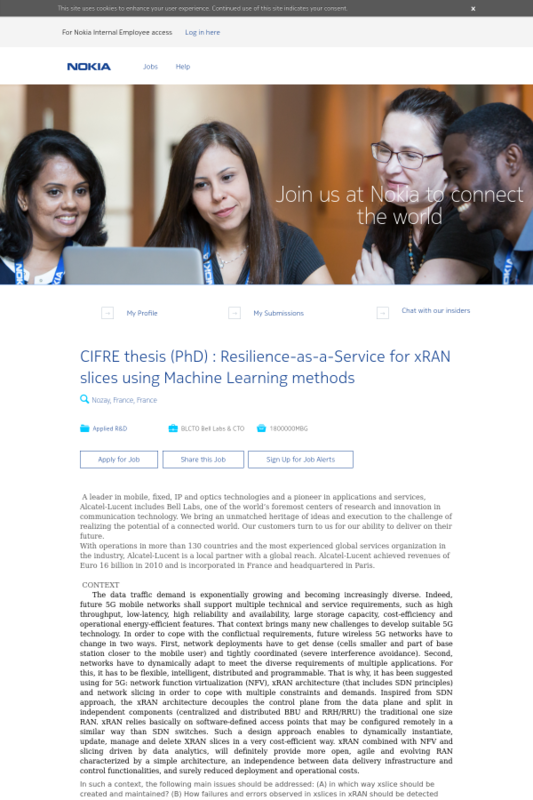 (2) The resilience update instant: using Machine Learning in order to classify criticality of anomalies (massive and isolated) and therefore to decide if it is worthy or no to launch an update cycle of a resilience solution. (3) The reconfiguration of resilience solutions: The problem shall be formulated as a multi-objective optimization one and solved using heuristics inspired from AI techniques. Ideal candidate should a solid mathematical background, especially in probability and statistics. The candidate should be eager to tackle new challenges in the area of machine learning and deep learning, distributed optimizations. He/she should have a good background in networking technology and familiar with LTE RAN and 5G. It is imperative that the candidate has a perfect proficiency in Python/C/C++ or tensorflow/keras, or other scripting languages. Lastly, the candidate should demonstrate a good motivation and autonomy. Good communication skills (written and verbal) in both English and French are required.